Cold Relief: HayMax, Lysine, King Bio, Natra Bio, Liddell, SinuFix! Natural Pollen Barrier Balm: Natural Pollen Barrier Balm is a 100% natural organic nasal balm that is applied to the rim of the nostrils. Natural Pollen Barrier Balm acts as a trap – or a blocker when applied to the bottom of the nose traps some of the pollen, dust or pet allergen before it enters the body. If there is less allergen in the body, there's less for the body to react against. It has been proven to reduce dust and pet allergens and more than a third of pollen from entering the body. Less allergen, less reaction. 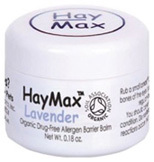 Natural Pollen Barrier Balm does not cure hay fever, dust and pet allergies, it works on the cause to try to reduce or, in some cases, even eliminate the effects of the allergen. Suitable for children and pregnant and breastfeeding women to use. For external use only. Ingredients: Beeswax, Sunflower oil, Aloe Vera. Ingredients: Beeswax, Sunflower oil, Lavender essential oil. HEALTH RELATED/COLD RELIEF: Natural Pollen Barrier Balm, 0.18 oz. 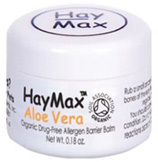 • H-Balm Control Extra Strength: Extra strong organic herpes treatment to heal damaged skin. H-Balm Control Extra Strength is a natural treatment for the herpes virus. Features our famous dual approach to suppressing outbreaks of herpes, but with double the potency of H-Balm Control. This extra strong herpes remedy kick starts immunity functionality whilst healing damaged skin. Doctor recommended, FDA registered and approved for over the counter sales. Fast-acting herpes relief and fortified with extra terpene oxides. Can be used on its own or with anti-viral medicines. WARNINGS: As with any drug, if you are pregnant or breast-feeding, ask your doctor before using. Not for use on children under the age of 36 months. For external use only. 11 ml. ORDER NOW! Active Ingredients: Calendula Officinalis 10X HPUS, Natrum Muriaticum 10X HPUS, Thuja Occidentalis 10X HPUS. Also Contains: Himalayan Cymbopogon Martini, Sri Lankan Cymbopogon Citratus, French Lavandula Super, Madagascar Pelargonium Graveolens, Australian Melaleuca Alternifolia, French Pinus Sylvestris. 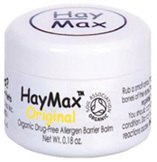 HEALTH RELATED/COLD RELIEF: H-Balm Control Extra Strength, 11 ml. 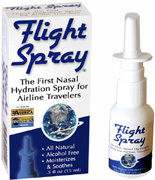 HEALTH RELATED/COLD RELIEF: Flight Spray, 0.5 oz. • SinuOrega Nasal Spray: Health practitioners agree a saline based nasal wash is the best approach for cleansing the nasal passages. SinuOrega combines a unique blend of the powerful essential oils of sage, bay leaf, clove and oregano in a saline base. SinuOrega is the only completely natural nasal spray with the power of Oreganol P73. Safe for everyday use! 2 oz. ORDER TODAY! Ingredients: Wild oils of Oregano, bay leaf, sage, clove bud oil, Sea Salt, Spring Water. HEALTH RELATED/COLD RELIEF: SinuOrega Nasal Spray, 2 oz. HEALTH RELATED/COLD RELIEF: Ionic Colloidal Silver, 7.6 oz. 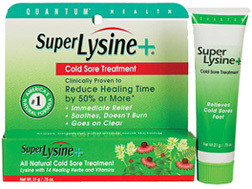 Super Lysine Cream: For the relief of tingling, blistering, itching and pain associated with cold sores. Clinically proven to reduce healing time by 50% or more. Immediate relief, calms, doesn't burn, and goes on clear. Super Lysine + is all natural cold sore treatment and made with 14 healing herbs and vitamins. External use only. 0.75 oz. ORDER TODAY! • Super Lysine Cream: 0.25 oz. ORDER TODAY! • Super Lysine Cream: 0.75 oz. ORDER TODAY! Ingredients: Active Ingredient: Zinc Oxide (1.2%). Inactive Ingredients: L - lysine, Vitamins A, D, and E in a natural base of Olive Oil, Yellow Beeswax, Goldenseal Extract (Hydrastis Canadensis), Propolis Extract, Calendula Officinalis Extract, Echinacea Angustifolia Extract, Cajeput Oil, Tea Tree Oil, Gum Benzoin Tincture, Honey. • Thera Zinc Oral Spray: Two sprays every couple of hours of Thera Zinc Oral Spray is the tastiest way to provide ionizable Zinc to your throat. Thera Zinc is sprayed in the back of the mouth, delivering powerful nutrients to the areas requiring the most protection and soothing the throat. Thera Zinc can be used by adults and kids, and offers calming Menthol, Slippery Elm, Clove Bud Oil, immune enhancing Zinc, Echinacea and Elderberry. 4 oz. ORDER TODAY! Ingredients: Zinc (from Zinc Gluconate) Proprietary blend of: Purified Water, Zinc Gluconate, Vegetable Glycerin, Soy Lecithin, Peg-40 Castor Oil, Menthol, Peppermint Oil, Clove Bud Oil, Slippery Elm Extract, Stevia Extract, Echinacea Extract, Elderberry Extract, Wild Cherry Bark Extract. HEALTH RELATED/COLD RELIEF: Super Lysine Cream, 0.25 oz. HEALTH RELATED/COLD RELIEF: Super Lysine Cream, 0.75 oz. HEALTH RELATED/COLD RELIEF: Thera Zinc Oral Spray, 4 oz. • SinuFix Mist: For the temporary, soothing relief of nasal congestion, sinus congestion and pressure and dry, irritated nasal passage membranesassociated with sunusitis, irritated/swollen sinus passages, hay fever, cold, or other upper respiratory allergies.Helps clear nasal passages and promote nasal and/or sinus drainage. 0.5 oz. ORDER TODAY! Active Ingredients: Allium Cepa 6X; Ambrosia Artemisiaefolia 6X; Argentum Metallicum 8X; Echinacea Angustifolia 3X, 6X, 12X; Euphorbium Officinarum 4X, 6X, 12X; Hepar Sulphuris Calcareum 8X; Hydrastis Canadensis 3X, 6X, 12X; Kali Bichromicum 6X, 10X; Kali Sulphuricum 3X, 6X, 12X; Lemna Minor 3X; Luffa Operculata 6X; Origanum Vulgare 3X, 6X; Pulsatilla 3X; Sabadilla 6X; Sanguinaria Canadensis 6X; Silicea 8X; Spigelia Anthelmia 3X. Other Ingredients: Aloe Vera Extract (patented organically grown) Butterbur, Grapefruit Oil, Green Tea Extract, Purified Nano Silver (patented process), Quercetin, Sorbitol, Stinging Nettle, Tea Tree Oil. • SinuFix Mist Super Strength: Super Strength SinuFix Mist is an advanced formula explicitly designed to combat the virus induced nasal allergy/sinus/cold/flu-like symptoms that may result from exposure to germs and viruses in the air in any crowded, potentially germ-infested environment. For the temporary‚ soothing relief of virus-induced nasal and sinus congestion and pressure‚ dry‚ irritated nasal membranes associated with a cold and sinusitis‚ irritated/swollen sinus passages‚ hay fever‚ overuse of decongestant sprays or drops‚ or other upper respiratory allergies (allergic rhinitis). Helps cleanse nasal passages and promotes nasal and sinus drainage. 0.5 oz. ORDER TODAY! Active Ingredients: Allium Cepa 6X; Ambrosia Artemisiaefolia 6X; Argentum Metallicum 8X; Echinacea Angustifolia 3X, 6X, 12X; Euphorbium Officinarum 4X, 6X 12X; Hepar Sulphuris Calcareum 8X; Hydrastis Canadensis 3X, 6X, 12X; Kali Bichromicum 6X; 10X; Kali Sulphuricum 3X, 6X, 12X; Lemna Minor 3X; Luffa Operculata 6X; Origanum Vulgare 3X. 6X; Pulsatilla 3X; Sabadilla 6X; Sanguinaria Canadensis 6X; Silicea 8X; And Spigella Anthelmia 3X. Other Ingredients: Aloe Vera (patented, organically grown), Bitter Melon Extract, D-Mannose, Grapefruit Seed Extract, Green Tea Extract, Licorice Root Extract, Purified Nano Silver (patented process), Sorbitol, Tea Tree Oil. HEALTH RELATED/COLD RELIEF: SinuFix Mist, 0.5 oz. HEALTH RELATED/COLD RELIEF: SinuFix Mist Super Strength, 0.5 oz. • Cold & Sinus Nasal Spray: Natural Cold & Sinus Nasal Spray is blended with Echinacea and Goldenseal to help relieve the toughest cold symptoms. For the temporary relief of cold and sinus symptoms, including nasal congestion, runny nose, sneezing, headache and sinus pressure. NatraBio Cold & Sinus Nasal Spray offers all natural relief from cold and sinus symptoms without the use of antihistamines and is a non-addictive continuous use formula with no side effects and no contraindications. 0.8 oz. ORDER TODAY! • Head Cold: Head Cold Relief is a homeopathic blend to help relieve symptoms such as headache, congestion, sore throat, runny nose, sneezing, itchy, watery eyes, fever and chills while gently stimulating immune function. 1 oz. ORDER TODAY! Active Ingredients: Echinacea Angustifolia 3X Hydrastis Canadensis 3X Sanguinaria Canadensis 3X Aconitum Napellus 6X 12 30X Allium Cepa 6X Arsenicum Album 6X Euphrasia Officinalis 6X Kali Bichromicum 6X Pulsatilla Nigricans 6X. Inactive Ingredients: Purified Water USP Alcohol. • Sinus Relief: Sinus Relief is a non-drowsy homeopathic formula offers natural relief for the symptoms of sinus headache, nasal congestion, sinus pressure, runny nose and sneezing. Helps deliver fast, effective relief in a speedy and convenient liquid formula, Sinus Relief is strong enough for adults yet gentle enough for all ages. 1 oz. ORDER TODAY! Active Ingredients: Euphorbium Officinarum 3X, Antimonium Tartaricum 6X, Kali Bichromicum 6X, 12X, 30X, Mercurius Iodatus Ruber 6X, Spongia Tosta 6X, Hepar Sulphuris Calcareum 10X, 20X, 30X. Inactive Ingredients: Purified Water, USP Alcohol. • Sore Throat Unflavored Liquid: Sore Throat Relief is a homeopathic combination to help bring relief to sore, red, aching, irritated, or hoarse throats. Delivering natural relief for the symptoms of Sore Throat, Laryngitis, Throat Irritation, Hoarseness, and Swallowing Difficulty. 1 oz. ORDER TODAY! Ingredients: Aesculus Hippocastanum (Horse Chestnut) 6x, Belladonna (Nightshade) 6x, Ferrum Phosphoricum (Iron Phosphate) 6x, 12x, Kali Bichromicum (Potassium Dichromate) 6x, 12x, 30x, Mercurius Iodatus Ruber (Mercuric Iodide) 6x, Phytolacca Decandra (Poke Root) 6x, Purified Water 20% U.S.P Alcohol. • Sore Throat Pain Relief Spray: Sore Throat Pain Relief Spray is a homeopathic liquid that blends Zinc and Echinacea for natural soothing of sore throat pain. Offers relief from pain, irritation and difficulty swallowing, and symptoms of hoarseness or laryngitis.. Consult with a doctor if before using with children under 12 years of age. 0.25 oz. ORDER TODAY! Active Ingredients: Echinacea Angustifolia (Cone Flower) 1X, Eucalyptus Globulus (Blue Gum Tree) 1X, Thymus Vulgaris (Garden Thyme) 1X, Zincum Gluconum (Zinc Gluconate) 2X, Phytolacca Decandra (Pokeweed) 3X, Lycopodium Clavatum (Club Moss) 4X, Capsicum Annuum (Cayenne) 6X, Mentha Piperita (Peppermint) 6X, Phosphorus (Phosphorus) 6X; Inactive; Purified Water, Natural Sweeteners, 20% USP Alcohol, And Natural Flavors. HEALTH RELATED/COLD RELIEF: Cold & Sinus Nasal Spray, 0.8 oz. HEALTH RELATED/COLD RELIEF: 1 oz. • Cough + Bronchial: Cough + Bronchial provides the calming relief you need from nagging coughs and bronchial congestion with this gentle, fast-acting spray. Cough + Bronchial help reduce tightness of the chest, coughing, and buildup of mucous in the chest and airways, chest soreness, and swiftly bring you back to your best. 1 oz. ORDER TODAY! Active Ingredients: Antimon Tart 200C, Arsenicum Alb 200C, Arsenicum Iod 200C, Arum Triph 30C, Baptisia 3X, Bryonia 200C, Drosera 30X, Echinacea 3X, Eupatorium Perf 200C, Kali Brom 6X, Lung Suis 6X, Merc Corros 200C, Sticta 200C, Sulfur Iod 200C, Urtica Ur 200C. Inactive Ingredients: Organic Alcohol 20% V/V, Purified Water. • Sinus Congestion + Headache: Sinus Congestion + Headache helps encourage sinus drainage and alleviates sinus congestion, sinus pressure, and headache pain. Signs of sinus congestion can be quickly relieved with Sinus Congestion + Headache, a safe and effective homeopathic oral spray that is 100% natural with no artificial additives or preservatives. 1 oz. ORDER TODAY! Active Ingredients: Antimonium Tart 6X, Arsenicum Iod 200C, Asafoetida 30C, Baptisia 3X, Echinacea 3X, Eupatorium Perf 3X, Euphorbia Pil 3X, Hepar Sulph Calc 30X, Hydrastis 30C, Kali Bic 30C, Kreosotum 30C, Lachesis 200C, Merc Iod Rub 10X, 200C, Pyrogenium 200C, Silicea 30C, Teucrium Mar 3X. Inactive Ingredients: Organic Alcohol 20% V/V, Purified Water. • Allergy: Allergy helps relieve allergies from pets, pollen/hay fever, dust mites, insect bites, and medications. Two sprays of this advanced homeopathic remedy helps alleviate itchy, watery eyes, headaches, sneezing, runny nose, and rashes. 1 oz. ORDER TODAY! Active Ingredients: Allium Cepa 6X, Apis Mel 3X, Aralia Rac 6X, Arundo 30C, Baptisia 3X, Echinacea Ang 4X, Euphrasia 6X, Gelsemium 200C, Histaminum Hydrochloricum 12X, Lycopodium 6X, Rhus Tox 200C, Sabadilla 6X, Sanguinaria 200C, Urtica Ur 3X, 200C. Inactive Ingredients: Organic Alcohol 20% V/V, Purified Water. • Herbalmist Throat Spray: Throat Spray herbal mist with ehinacea & tea tree oil. Bring balance to your body. 1 oz. ORDER TODAY! Ingredients: Echinacea Root, Licorice Root, Sage Leaf, Hyssop Herb, Goldenseal Root, Isatis Leaf, Marshmallow Root, Peppermint Oil, Tea Tree Oil and Thyme Oil. Herbs Extracted in Purified Water, Grain Alcohol (Ethyl Alcohol USP), Honey and Vegetable Glycerine. Contains 20-25% Alcohol. HEALTH RELATED/COLD RELIEF: Herbalmist Throat Spray, 1 oz. • Acusine Nasal Spray: Acusine Nasal Spray has been formulated to help normalize breathing, unplug stuffy nose, decrease inflammation, and prevent nasal drying. Alleviates nasal dryness, sinus congestion, runny nose, nose bleeds. The initial mild burning sensation is temporary and harmless, but activates and opens the nasal passages. 0.5 oz. ORDER TODAY! Ingredients: Active Ingredients: 100mL contains: 10mL Hydrastis canadensis 4x HPUS, 10mL Lycopodium clavatum 3x, HPUS, 10mL of Ephedra vulgaris 3x HPUS, 10mL Mezereum 3x HPUS, 10mL Petroleum 8x HPUS, 10mL Pulsatilla 3x HPUS, 10mL Thuja occidentalis 10x HPUS. Inactive Ingredients: Base of Aqua Demineralisata, Aqua Hamamelidis, Alcohol 7.7% by volume, Glycerin, and Thymol. HEALTH RELATED/COLD RELIEF: Acusine Nasal Spray, 0.5 oz. • Petro-Carbo Medicated First Aid Salve: Relied upon for generations, Petro-Carbo Salve is still a staple for every home medicine cabinet and first-aid kit. Its active ingredient is phenol (carbolic acid), but it derives other benefits and its unique aroma from botanicals such as camphor, oil of spruce and the tea tree relative, cajeput. This versatile product is safe and effective for relieving pain and itching associated with: minor cuts, burns, skin irritations, scrapes, insect bites. 4.37 oz. ORDER TODAY! Active Ingredient: Lidocaine hydrochloride 2.25%. Inactive ingredients: Diazolidinyl urea, emulsifying wax, methylparaben, mineral oil, propylene glycol, propylparaben, reconstituted aloe vera gel, steareth-2, water. • Menthol Camphor Vapor Rub: Relieve symptoms associated with the common cold with this naturally formulated chest rub.We have developed the medicinal ingredients of our legendary products into earth conscious base to give you the best of both worlds. Parafin and petrolatum free. 2.1 oz. ORDER TODAY! HEALTH RELATED/COLD RELIEF: Petro-Carbo Medicated First Aid Salve, 4.37 oz. HEALTH RELATED/COLD RELIEF: Menthol Camphor Vapor Rub, 2.1 oz.